What's with all the Baskets? Any 2011 convention attendee saw plenty of hostas planted in wire baskets in almost every garden on tour. So what's up with the baskets? They are vole deterrents, plain and simple. Readers of The Hosta Journal as far back as the 1990's could read about the trials and tribulations of battling voles on my property in Connecticut. 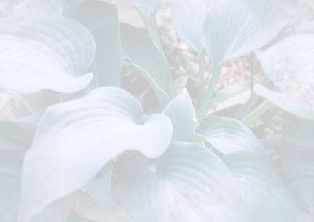 I seemed to be the only hosta gardener at the time who suffered from voles eating the roots and crowns of hostas and killing the plants. The only people who seemed familiar with voles were some of the nursery operators who were having them get into potted plants. Slowly but surely others have suffered the same gardening fate and have come to employ using wire baskets as a barrier method of keeping voles from eating hostas. 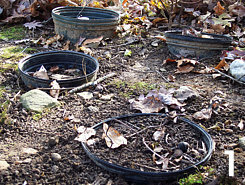 Planting in baskets is the most labor-intensive way to stop voles, but it is also the most effective. We've only had voles get into basketed hostas a few times, and those were usually ones that had been stepped on, flattening them out so the voles could walk right to their dinner. If the basket sticks out of the ground at least an inch, we've never seen voles climb it to get to the plant. Nearly every hosta in this garden of 1500+ plants is grown in a wire basket. The only exceptions are the minis because they don't have enough crown material to attract voles to them, and volunteer seedlings which might be nice enough to escape the compost pile but not really special enough to warrant the extra protection of a basket. My first attempt at vole protection involved planting hostas by sinking nursery pots into the ground using a mix that was about half garden soil. This was effective for protection, but the plants deteriorated after a few years. Obviously they needed to be able to get their roots out into the surrounding soil, and the idea of pulling them up and repotting them every three years or so didn't have much appeal to me. Tree roots from my red maples also got into the pots through the holes at the bottom and effectively tied the plants to ground. For round two, I thought I'd try hardware cloth made of galvanized wire in a half-inch mesh. (2) It seemed the perfect solution for letting plants grow naturally in the soil while protecting them from hungry tunnellers. My mom Rita and I spent morning after morning constructing 25 a day until we had about 400 made and planted. That was before plastic wire ties, so each strand of wire was connected into a cylinder by bending each one with needle-nose pliers.Talk about tedious! Fast forward to the next stage, making wire cylinders using cable ties, which made it a little easier. One drawback to this method appeared years later. 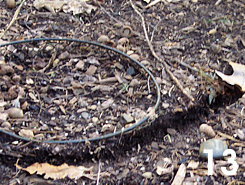 The hardware cloth cylinders expanded as the plants grew and spread open (3), allowing the voles access to the plants. When making these, be sure to overlap the wire a few inches to prevent this. On to the newest thing in vole control, pre-made vinyl-coated wire wastebaskets (4). 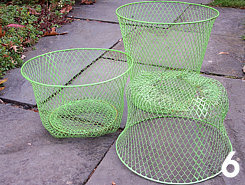 These wire baskets have replaced the nasty old hardware cloth ones completely in our garden. They are purchased from dollar stores of any name, Dollar Tree, Happy Dollar, Dollar General, etc. In the Eastern USA there is a chain called Christmas Tree Shops, and they have the wastebaskets in stock at back–to-school time. They come in many different colors and when I was first buying them I only bought ones that were black, or brown, or green. Now I scour every store I visit to see if they stock the baskets, and buy any size and any color they have, as they have become difficult to find of late. These pre-made baskets are a bargain for $1US, and we've seen them hold up for 12 years or more in the ground. There are a few mail order Internet spots where the baskets can be ordered in lots of one hundred, but the shipping costs can be a bit high. Sharing an order has been popular here in the Northeast USA. When all you can find are the funky colors, a quick spray of paint(5) does the trick to help disguise their existence. 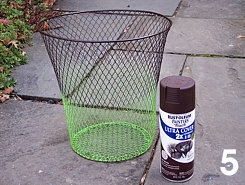 We prefer Rustoleum's Ultra Coat, which comes in several shades of brown and covers better than the others, making a can goes a long way. We have found that most hostas here will grow to a nice size clump within the largest available basket. 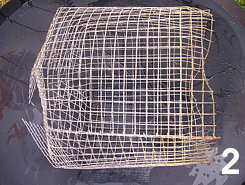 Occasionally, we have made a specialty size for an ‘Empress Wu’ or ‘Key West’ giant by making a cylinder out of hardware cloth wire and cable ties. 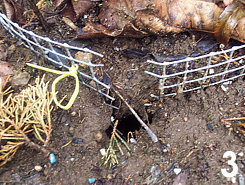 The longest a cylinder needs to measure is 12 inches ( 30.5 cm) so it can be deep enough for the root ball and to keep voles from entering from beneath the wire barrier. According to our local county extension office, they will only dig down 9 inches or so. 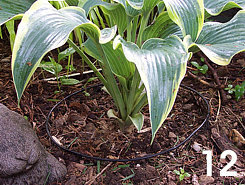 For most hostas, however, we shorten the basket as shown(6) to about 11 inches total with 9 inches buried. Hosta roots normally don't go much deeper than that. 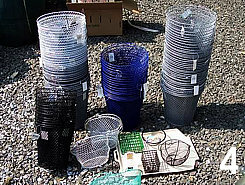 If you are experiencing damage and destruction from voles in your garden and aren't afraid of a little extra work, I can testify that wire baskets really work. They are the best deterrent, especially if you are nervous about using poison baits. 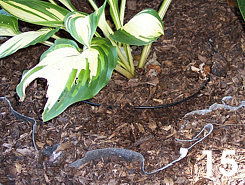 Below is the step-by-step method that we've developed for using wire wastebaskets to protect hosta crowns. Whatever mix you prefer to use in your garden beds can be prepared in a wheelbarrow and used in a basket. We churn a wheelbarrow full of soil from the planting hole and leaf compost with a good amount of granular fertilizer (10-10-10 or similar). If planting in unamended soil, be sure to include at least 70% mineral content, as too much organic material will cause the plant to sink into the ground as the organics deteriorate. 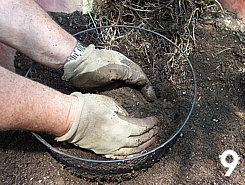 Otherwise use a mix similar to the amended soil in mineral content. Fill the bottom of the basket with enough mix to set the crown 2 inches below the rim (top) of the wire surround, packing it in firmly. Build up a mound (9) in the middle that the crown of the plant can rest on. Set the plant on this mound and tuck the roots into the basket. Add soil mix around the root ball. 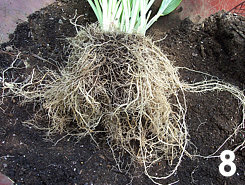 Be sure to pack the soil around the roots to eliminate air pockets. Fill basket (10) with enough soil to top out with one inch of mix above where the leaves come out of the crown. 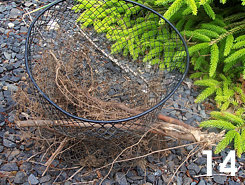 Dig a hole just large enough (11) to pack two inches of garden soil around the outside of the basket and deep enough to allow that one inch of wire basket at the top to protrude out of the soil. 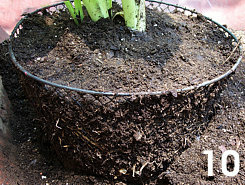 The end result should have the level of the soil in the basket the same or slightly higher than the surrounding soil. 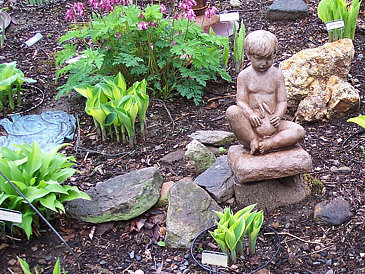 (12) Pack garden soil around to eliminate air pockets and water as is normal for a newly-planted hosta. Voles are surface travelers for the most part. They will dig down once they have found a food source but when they are searching for food, they tunnel along until they run into a rock or a tree trunk, or this case a basket rim (13), then they go around it and continue on. When newly planted, the baskets are obvious, but as the clumps mature the leaves grow to cover the ground-level view and they disappear into the landscape, as can be seen in the first two photos above. A layer of mulch nicely hides the basket rims as well, but don't make it too deep. That’s pretty much it. 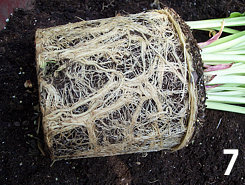 The baskets allow the roots of the hostas to grow through while protecting the crown, but they aren't the only roots that can grow through the baskets. (14) Planting in baskets doesn’t help if you have tree root problems. Where we have a root problem, we dig a bigger hole, and line it with tree root fabric treated with SpinOut™ to slow down the root invasion. 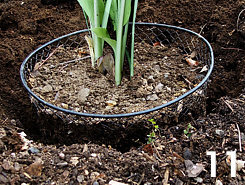 Then put a basketed hosta in the middle, Filling the area between the basket wall and the cloth with soil. (15) We also leave an inch or so of that fabric extending above ground level also but that’s another article! 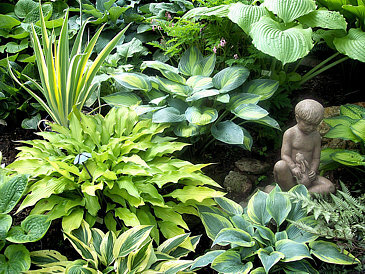 Good luck in your battles against the critters that also love your hostas. We have found these wire baskets to be our best defense against the mighty vole.